Ancient Egyptians made them to appease their gods. The Greeks believed that a god wouldn't intervene on your behalf without one. Whether you're forming a new relationship with a deity or continuing a familiarship with a spirit, offerings are often essential to our practice. But why exactly do we make them? 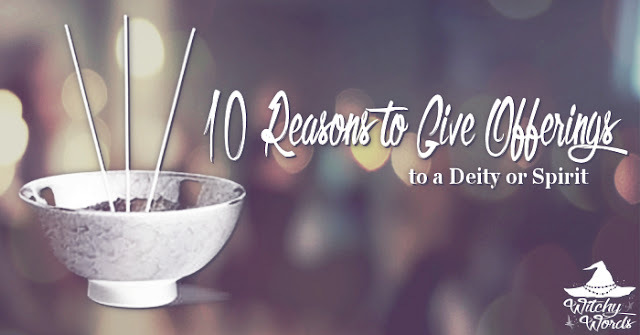 Here are 10 reasons to support giving offerings to entities in your Craft! As humans, we often bond over food. Our first date might be over dinner, or we might form a whole new friendship over coffee. By giving a little food and water to an entity you're wanting to make contact with, you're saying "I'm open to talk." Once you've established a relationship, hospitality continues to build it. In the same way you offer a friend a glass of water when they come over to your house, offerings show that we are warm and receptive - and that we want that entity to return. It's difficult to have any kind of relationship with someone you don't respect. Offerings are our way of displaying reverence by willingly giving and sacrificing on the entity's behalf. The entire universe runs on exchange. We give money to receive service, trade goods and goods and pay off debts in favors. Non-corporeal relationships are no different. We're not bribing or appeasing the entity - we're simply showing that we have an understanding of how the universe works. The World can be Hostile. We offer milk and honey to the Fae at Beltane and Midsummer to stay in their good graces. We offer bread and water to the Wild Hunt in the winter so that they will not take from us forcibly. In a world of hostility, attempting to propitiate an entity can work out in your favor. Protection and prevention of harm are essential to our well-being. The World can also be Kind. Just as we give gifts to family and loved ones, we freely give love to patron deities and familiar spirits without expecting anything in return. This love can be shown in the form of offerings, gifts we leave for them in their name. We Must Learn our Place Within the World. If we do without when we give, we often call this a sacrifice. Offerings that come at a minor personal inconvenience or loss remind us that there are less fortunate, that we often have more than we actually need and that we sometimes want in excess. Offerings Tie us to our Roots within Society. In reconstructionist, cultural or hereditary paths, our ancestors may have made certain offerings in a timely fashion over centuries. As we take over the reins, we may create offerings as a way of maintaining those long-held agreements and relationships. Offerings Keep us Grounded in Reality. Like a good exercise routine or s fixed sleep schedule, offerings can create the discipline we sometimes lack in our Craft. When we perform rites we see as necessary to our personal growth and well-being, we condition ourselves to lead our best life in all aspects. And Sometimes, We Offer Because they Ask. Occasionally, it really is just that simple: The entity asked and so you give. We may or may not understand the reasoning for the request - and there may be no reason at all - but we understand that this is the way the relationship works, and so we offer. Limitations are key in getting what you want out of your practice. You should establish these boundaries early in your relationship with the non-corporeal. If the offering requested is something that goes against your morals or ethics, or against the law of the land, you probably shouldn’t pursue it. Gods and spirits can trick you into crossing lines you don’t want to cross. Do not allow that to happen. Additionally, if the offering causes you to starve, miss rent or otherwise harm yourself, you shouldn’t do it. As the saying goes, you cannot pour from an empty cup. You cannot give what you don’t have. Never put yourself in harm’s way for an offering. Now that you're armed with purpose behind your offerings, check out this tip on low-budget offerings and this huge list of potential offerings for your non-corporeal entity. Enjoy! Do you consider yourself an animist? The short answer is, in general terms, mostly yes. The long answer is far too long for the comment section. I primarily believe that items offer symbolism and that collective belief is what gives an item its "essence" or "energy." Most items have to be charged with our own personal energy to be useful - that is, to exude the essence or symbolism we give it in anything more than a metaphorical nature. Again, most, but certainly not all. That's my own personal belief, however, and a very light overview of it at that. I need to print this out and hang it up somewhere prominent. I make offerings reasonably regularly, but having read this I feel I need to start thinking about why I'm making each offering. I'm so glad this article could help, Vixxia! Part of my writing this was for similar reasons - to remind myself of the deeper meaning behind offerings rather than just handing them out without thought.